UDM Downloads > Flexible TreeView! 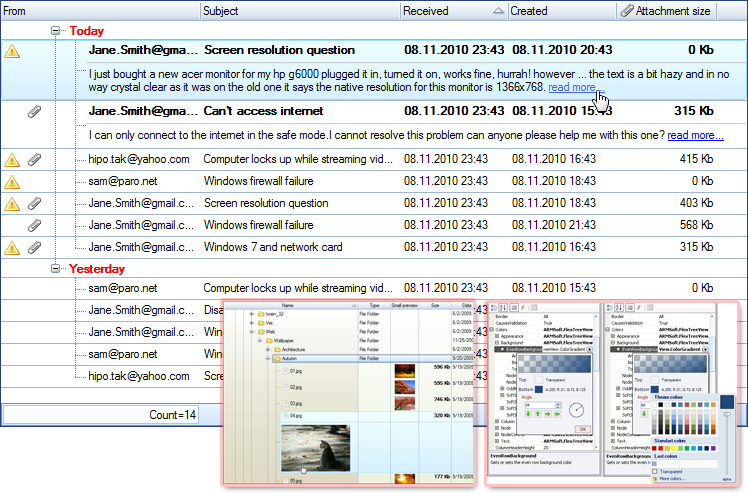 Flexible TreeView is the most flexible and fastest TreeView-ListView-Grid combination control on the market with many unique features inside. It provides developers with a flexible and powerful solution for presentation of hierarchical data with the possibilities not existing in any .NET treeview or listview control on the market today. It will: * Shorter release time. * Allow you to concentrate only on your application development. * Make your development process as smooth and easy as possible. * Make the style of your application unforgettable. resulting in lower total cost, faster time to market and increased customer satisfaction. The product offers many state-of-the-art features like: * Extremely fast as no one hierarchical control. Loads data source with 1 000 000 objects just in 5 seconds! * Themes support and complete customization. * Very easy programming API. * Columns and multi-column sorting support. * Unique expandable content mode which allows not to overload the treeview with information and at the same time be more informative for a selected node. * Unique node soft selection mode - allows to view additional node`s content when mouse hovers over the node which appreciably speeds up data viewing. * In-place editing. * HTML text support. * Text auto-wrapping. * Data binding. * Custom controls hosting. * Load on demand. * Multiple node selection. * Advanced drag & drop support even between many treeviews or other controls. * Summaries. * Wrap content to many levels. * Possibility to display data on the left side of the plus-minus sign. * Seamless integration with 3rd party libraries. * Cute and eye-catching image animation. * Watermark and advanced background settings. * and much more... Flexible TreeView allows to make the style of your application unique as well as intuitively clear to the most exacting user!